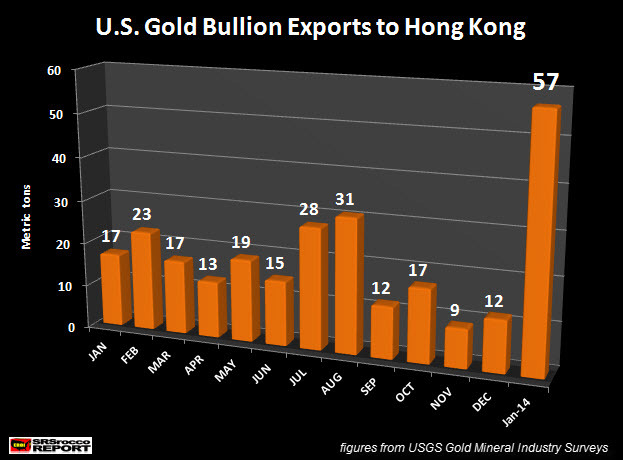 The figures are out and it looks like the United States exported a record amount of gold to Hong Kong in January. Not only was this a one month record… it was a WHOPPER indeed. Here we can see that the highest month of gold bullion exports to Hong Kong in 2013 was in August at 30.7 metric tons (mt)… let’s just say an even 31 mt. According to the data just released by the USGS, the United States exported a stunning 57 mt of gold bullion to Hong Kong in January. Not only is this 3 times more gold exported than January 2013 (17 mt), it was 84% more gold than the record month set in August (31 mt). As we can see, gold bullion is fleeing the U.S. and heading to the East. Again.. that 57 mt figure is just gold bullion. Furthermore, total gold exports in January nearly surpassed the total hit in March of last year. Total U.S. gold exports in March, 2013 were 80.8 mt compared to 80.7 mt in January of this year. As the West continues to play games with Monopoly money and Derivatives manufacturing, the East accumulates as much gold as it possibly can. While Main Stream Media and its Banker cohorts release bearish $1,050 price targets for gold, the Asians and Indians smile as they build the largest amount of gold stocks in the world. I get a real kick at the degree of negative sentiment coming from many gold and silver investors. Who said this was going to be easy? It’s simply amazing to watch a DIEHARD gold or silver bug become bearish and downright nasty now that times are tough. However, this is exactly what the FIAT MONETARY AUTHORITIES hand in mind. Unfortunately, many have fallen for their plan… HOOK, LINE & SINKER.